For many people with a secular outlook, decorating the Christmas tree is the essence of Christmas. In Greece, this custom was imported from abroad and was introduced by the Bavarians*. 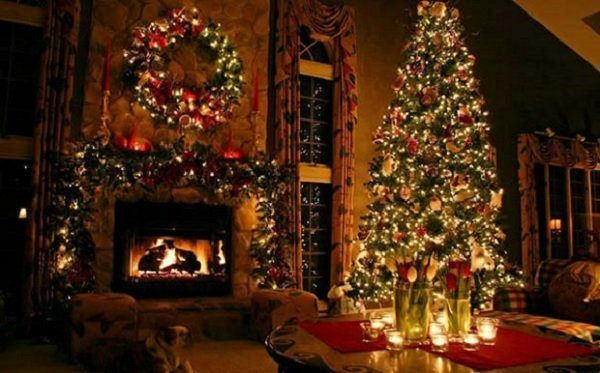 The first time a Christmas tree was decorated was in Otto’s palace and thereafter it spread throughout Athens. After World War II, the tree and its multi-coloured balls became a feature of all Greek houses. Its forerunner was the Yule log, a large piece of wood from a pear or wild cherry tree. According to popular thinking, trees with needles kept at bay the demonic beings, the kalikantzari. In the old days, the Yule log was placed in the hearth on Christmas eve. The ash from the logs protected the house and the fields from all evil. The Yule log was replaced by the Christmas tree, which originated in Germany and spread to other European countries before crossing the Atlantic. Kostas Kaloyuris, however, a professor of Christian Archeology, claimed that the custom of the tree wasn’t of German origin, but came from the Near East. He bases this view on a manuscript in the British Museum. The text refers to a church that was built in 1512 by Anastasios I in Northern Syria, in which church were two large, copper trees. According to one tradition, decorating the tree was started by Martin Luther who was walking through a forest one night and saw the stars twinkling through the branches in the winter sky. He then conceived the idea of placing, in his own house, a lighted tree which would depict the starry heavens from which Christ came down to earth. Metropolitan Ierotheos of Nafpaktos sets out an interesting view in his book Δεσποτικές Εορτές (Feasts of the Lord). ‘I suspect that the custom of decorating a tree during the Christmas period isn’t merely a custom which came to us from the West and which we should replace with something more Orthodox. Of course, I haven’t delved much into the history of the Christmas tree and its real meaning and where it came from, but I think it’s linked to feast of Christmas and its real meaning. In the first place, there’s a connection with the prophecy of Isaiah: “There shall come forth a rod out of the root of Jesse and a blossom shall come up from this root” (11, 1). Kosmas the Hymnographer has this prophecy in mind when he wrote: “You sprang, Christ, from a rod from the root of Jesse and a blossom from the Virgin”’. The root is Jesse, the father of David, the rod is King David, and the blossom which sprang from the root and the rod is the Mother of God. The fruit which resulted from the blossom of Our Lady, is Christ. That’s what is presented in this wonderful icon. So the Christmas tree can remind you of the family tree of Christ as a person, of God’s love and also of the successive cleansings of the forefathers of Christ. At the top of the tree is a star, which is Christ, Who is God and human. Then there’s the Christmas tree, which recalls both the tree of knowledge and also the tree of life, though principally the latter. It underlines emphatically the truth that Christ is the tree of life and that we can’t live, we can’t fulfil the purpose of our existence, unless we taste of this tree which gives us life. You can’t imagine Christmas without Holy Communion. And, of course, it’s not possible that this should contribute to our deification in Christ unless we defeat the devil when we find ourselves faced by temptation, as regards the tree of knowledge of good and evil, when our freedom is tested. 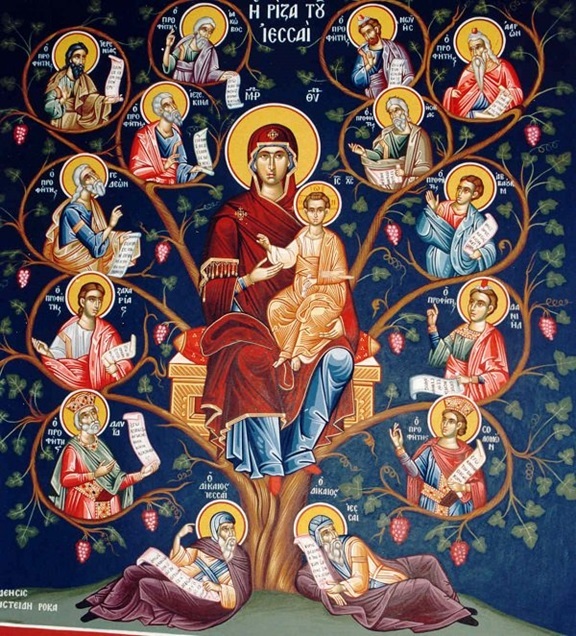 We rejoice and are glad because the ‘tree of life blossomed from the Virgin in the cave’. *After the successful revolution against the Turks, the Greeks had imposed upon them by the Great Powers a Bavarian king, Otto. He brought with him his Bavarian courtiers and their ideas. His disastrous reign was followed by that of another German dynasty which culminated in the loss, in 1922, of the almost four-thousand-year old presence of Greeks in Asia Minor [WJL].